The following material is based on Michael Towsey’s essay, “Tax in a Proutist Economy, Version 2.1”, PROUT Institute of Australia, 24 June 2005, 39 pp. To provide public goods and services, such as police, courts, schools, roads, garbage collection, etc. To pay for public insurance schemes, such as retirement pensions, health and accident insurance. To promote more equitable distribution, through programs such as unemployment insurance, welfare payments and food stamps. Some governments, such as those of Scandinavia, are interested in reducing the gap between rich and poor, unlike the United States. In 2001 and 2003, President George W. Bush pushed through legislation that cut personal income tax rates, cut tax rates on capital gains and dividends, and cut the federal estate (inheritance) tax on multi-millionaires. The savings from these cuts, which cost the government US$2.5 trillion by the end of 2010, went to the wealthiest households. Most government budgets, whether in the United Kingdom, Poland or New Zealand, are equal to about 40 percent of GDP, but half of that is transfer payments to households in pensions and unemployment. Governments should set tax levels sufficient to fund their spending without borrowing, except in extraordinary circumstances, such as recovery from natural disasters. Equity or fairness: In fact there are two types of equity, that are not necessarily consistent with one another. First is the benefit principle: those who benefit from the service provided by the tax should pay it. For example, motorists pay taxes to maintain the highways and airplane passengers pay airport tax. Second is the ability to pay principle, which means those who are wealthier should pay more. So income tax is progressive if the richest pay a higher percentage; whereas most sales taxes are regressive, causing the poor and middle classes to pay a much higher percentage of their income than a rich person who buys the same items. Efficiency: taxes should not cause undesirable behavior or distortion, such as smuggling or black markets controlled by criminals. 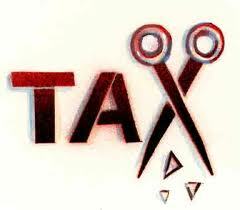 Simplicity: Simple taxes are inexpensive to collect and administer. An example of one that is not simple is the U.S. income tax, which costs the Internal Revenue Service US$12 billion annually to collect, and which causes citizens to spend more than 6 billion hours and US$200 billion per year to comply with it; the instructions of the U.S. federal tax code in 2010 were 71,684 pages in length! Personal Income Tax: In addition to the complexity and high enforcement and compliance costs mentioned above, income tax causes a high percentage of errors, impedes economic decision making, leads to inequitable treatment of citizens, and promotes tax avoidance, evasion and an underground economy. It is bad psychology to give money and then take it back. Rather than abolishing this approach immediately, it might be wiser to gradually raise the tax-free levels, freeing the working classes from this burden, while increasing tax at the highest income levels to promote equity. Corporate Income Tax: Large privately-owned or publicly-traded corporations are not acceptable in a PROUT economy. However, what happens if a PROUT cooperative becomes very successful and starts earning big profits? This would signal to the rest of the economy that a good business opportunity is available–new cooperatives could jump in to replicate its success in different places. If the co-op becomes too large, it would have to split or become a public company. Instead of the government taking the excess profits, they could be directed to local charities. For example, all cooperatives in Mondragón, Spain, donate 10 percent of their profits to charities. Personal Consumption Tax (Sales Tax and VAT): Essential goods, such as food and medicine, will be exempt from tax. Semi-essential goods and services should be taxed, and non- essential luxury goods and services would be taxed at the highest rate. A simple sales tax is charged only at the final point of sale, and a Value Added Tax (VAT) appears the same to the buyer. But in fact VAT levies a tax at each stage in a production sequence, so that collections, remittances to the government, and credits for taxes already paid occur each time a business in the supply chain purchases products from another business. Sarkar wrote, “Taxes should be levied at the starting point of production,” and some PROUT economists consider VAT as the most logical method to do that, though it does have higher administrative and compliance costs than a simple sales tax. Resource Tax: Taxes on various natural resources are an important way for a PROUT government to encourage the use of some resources, discourage the use of others and to fund research into alternative technologies. The tax rate on each resource should be adjusted to reflect its reserves, as well as all social and environmental costs. The Netherlands and Scandinavia are pioneering ‘eco’ or ‘green taxes’ that promote environmental protection. Resource taxes would cover water, air, forests, mineral ores, ocean resources and satellite bands. These areas require constant monitoring and ongoing scientific and economic research to effectively evaluate and adjust society’s impact on the environment. Wealth and Inheritance Tax: A major cause of social injustice is extreme concentration of wealth, the gap between rich and poor. Wealth taxes in Austria, Denmark, Finland, Germany, Luxembourg, the Netherlands, Norway, Spain, Sweden, and Switzerland range from 0.5 to 2.5 percent. Proutist economist Ravi Batra recommends a progressive wealth tax in transition from a capitalist to a cooperative economy to shift wealth ownership. The rich would have to sell some assets to pay the tax. The United States now taxes 35 percent of the wealth that is passed on to descendants. Land Tax: This is very simple and efficient with low administration costs. Land cannot be hidden; ownership is easily established and land tax generates regular revenue. Land tax should be progressive, because wealthy people own more valuable land and thus should pay more tax. (But in the United Kingdom, the top landowners, who own more than 100,000 acres of land each, do not pay any taxes; rather, the British government pays them taxpayer money to maintain their lands!). Increasing tax on unutilized land in transition from a capitalist to a cooperative economy could shift land ownership and discourage speculation, reducing demand and lowering prices. Farmer’s cooperatives should be taxed a fixed percentage of their harvest, to reflect seasonal conditions. Special Purpose Taxes: These target particular kinds of economic behavior. For example, commodities harmful to people’s health, such as cigarettes and alcohol, should be taxed at rates significantly higher than normal sales tax. These are sometimes referred to as “sin taxes.” Under PROUT, neither the producers nor sellers of these items will be allowed to advertise or earn profits from their sales, and the revenue from such taxes will go to finance the health care system. The collection of taxes should be done by different levels of government. If a national government collects all the tax and distributes money to the regions, the regions would have minimal economic power. Tax sharing between different levels of government must be annually negotiated. PROUT advocates the abolition of income tax. In India today if income tax is abolished and excise duty on excisable commodities [goods produced within the country] is increased by only ten percent, there will be no loss of government revenue. When there is no income tax, nobody will try to accumulate black money. All money will be white money. As a result there will be economic solidarity, an increase in trade and commerce, more investment, more employment and an improvement in the position of foreign exchange. Intellectuals should demand the abolition of income tax. An established Proutist government would likely get money from resource taxes, consumption taxes, import tariffs and land taxes. A variety of user taxes, punitive taxes and other special-purpose taxes could be set according to social and economic policy. Finally, Proutist taxation depends on time, place and people, and will always strive for maximum utilization and rational distribution for the welfare of all. 2 Cato Handbook for Congress: Policy Recommendations for the 108th Congress, 2003. 3 P.R. Sarkar, “Some Specialties of PROUT’s Economic System,” Proutist Economics (Calcutta: Ananda Marga Publications, 1992), p. 20. 4 P.R. Sarkar, Discourses On PROUT. p. 15. 5 Kevin Cahill, Who Owns Britain? (London: Canongate, 2002). 6 P.R. Sarkar, “Developmental Planning”, Proutist Economics.